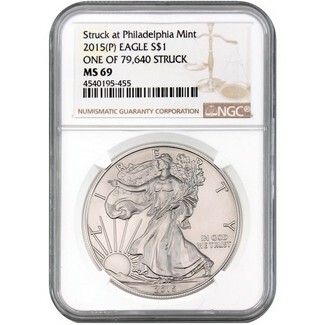 According to information recently released by the United States Mint a limited number of bullion Silver Eagles were struck at the Philadelphia Mint in 2015. Only 79,640 coins were struck, making this the lowest Bullion strike of this popular series. This coin has been certified by NGC as being one of these coins, and is in MS69 condition. The coin does not have a mint mark, and therefore has the(P) designation on the label indicating it was struck at the Philadelphia mint. Coin will arrive in wood storage box.